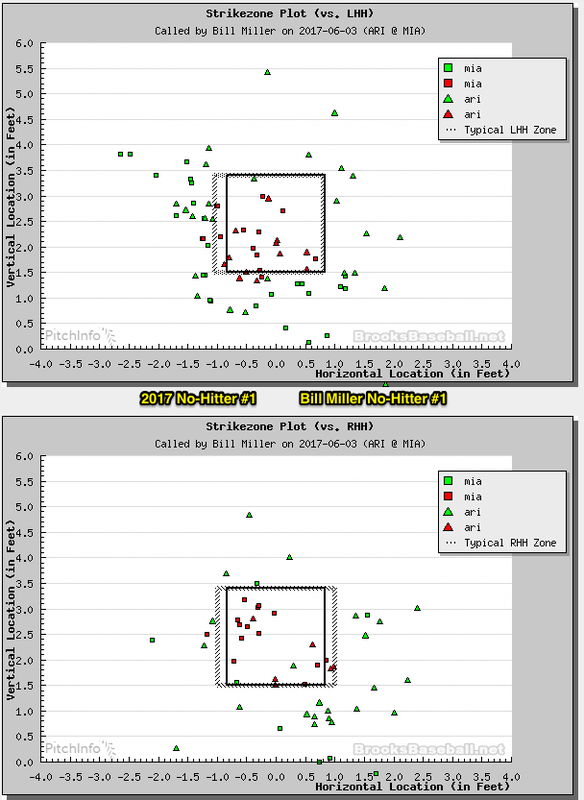 HP Umpire Bill Miller called Marlins pitcher Edinson Volquez's no-hitter against the Diamondbacks, the first of 2017. 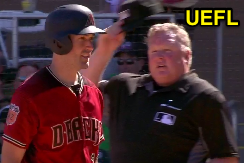 Miller was joined for Saturday's Diamondbacks-Marlins game by 1B Umpire Kerwin Danley, 2B Umpire Todd Tichenor, and 3B Adam Hamari. This is Miller's first career MLB no-hitter. Balls: 35 called balls outside of strike zone / 1 called ball within strike zone = 35/36 = 97.2% Accuracy. Strikes: 23 called strikes inside strike zone / 4 called strikes outside strike zone = 23/27 = >90.0% Accuracy. Total Raw Accuracy Score for Volquez = 58/63 = 92.1% Accuracy (+3 in favor of Volquez). Overall Game Score: 82/85 Balls + 38/45 Strikes = 120/130 = 92.3% +2 MIA. Plots via "Read More"